Article 691, Large-Scale Photovoltaic (PV) Electric Supply Stations, covers PV supply stations with a generating capacity of 5,000 kilowatts or more. The systems covered by this article differ from those covered in existing NEC Article 690, in that the power generated by a large-scale PV electric supply station is solely for the purpose of supplying power to an electric utility transmission or distribution system at medium or transmission-level voltages. Such facilities already exist and more are planned. Article 690 is oriented to utility-interactive or stand-alone systems that are used to directly supply a premises wiring system and is not a good fit for PV-generating facilities of this magnitude. Article 706, Energy Storage Systems, provides requirements covering permanently installed systems that can be stand-alone or interactive with other electric power production sources. Historically, lead-acid batteries—and, more recently, new battery technologies used for energy storage—have been covered in Article 480. However, batteries are not the only form of energy storage devices available today. Flow batteries, capacitors, flywheels, and compressed air are other forms. The article centralizes the requirements for all energy storage technologies, including the current requirements in Article 480, into a single NEC article. Article 710, Stand-Alone Systems contains requirements power production sources operating in stand-alone mode. This would apply to an off-grid systems having a source such as photovoltaic, wind, hydro, fuel cell, fossil-fuel powered engine generator or other that is not interconnected with an electric utility or other source of electrical power. The new article does not limit the size of these systems, but does allow the source to be sized smaller than the total calculated load as long as it is not smaller than the single largest item of utilization equipment. Other allowances include permission to have a 120 volt source supplying 120/240 volt distribution equipment. Use of this approach requires a special label that warns of the hazard of connecting a multiwire circuit to a single line 120 volt supply. communications equipment, computers and servers, variable speed motors, heating/ventilating/air conditioning equipment, and more. Efficiency is gained as the typical DC–AC, and then AC–DC, conversions are eliminated. DC distribution systems of this nature are currently being used in data centers throughout the world, and could in fact be used in any setting where on-site DC generation supply, such as a PV system, is used to supply a distribution system. Coupled with energy storage capability, such systems also provide for a reliable on-site system that is uncoupled from the typical offsite power system and thus not subject to interruptions occurring in the offsite sources. 427 for pipeline and vessel heating. Rules in Article 425 cover topics such as product certification, working space, control and circuit protection, marking and separate parts covering fixed industrial process resistance-type boilers and fixed industrial process electrode-type boilers respectively. If you have any issues accessing the YouTube version above, we have an alternative option hosted here. Please feel free to use the comment section below to discuss! NFPA is pleased to announce that select 2016 and 2017 editions of NFPA codes and standards have been published with shaded areas that indicate changes from the previous edition. NFPA is working to have a permanent solution in place for the 2018 editions of NFPA codes and standards. NFPA is continually working to develop the best tools for our stakeholders. We appreciate your continued patience as we develop and add this feature to our publishing system. Whether we are ready or not, fall is here in full force. A common fixture in the fall is the haunted house. Large or small, permanent or temporary, professional or amateur, haunted houses are popping up everywhere. Unfortunately, haunted houses can cause nightmares for more than just those that attend. Without the proper knowledge and understanding of the codes that apply, haunted houses can be a safety nightmare as well. Per NFPA 1, Fire Code, a haunted house is considered a special amusement building. By definition, a special amusement building is "a building that is temporary, permanent, or mobile and contains a device or system that conveys passengers or provides a walkway along, around, or over a course in any direction as a form of amusement arranged so that the egress path is not readily apparent due to visual or audio distractions or an intentionally confounded egress path, or is not readily available due to the mode of conveyance through the building or structure." A special amusement building is an assembly occupancy regardless of occupant load. Haunted houses use special effects, scenery, props, and audio and visual distractions that may cause egress paths to become not obvious. In haunted houses in particular, the presence of combustible materials and special scenery can also contribute to the fuel load should a fire occur. Because of this, the Code requirements are purposely strict to in hopes of avoiding a disastrous fire event. As we move into the Hallween and haunted house season, its easy to get caught up in the fun and overlook the safety issues that may arise. Through the provisions in NFPA 1, which can assist code officials and fire departments enforce safe haunted houses, and NFPA's halloween resources for consumers, everyone can stay safe this season. It may be hard to believe, but NFPA's latest report on Home Structure Fires shows that in 2010-2014, five general fire causes accounted for 84% of reported home fires, 91% of home fire deaths, and 82% of home fire injuries. Cooking equipment was the leading cause of home fires and fire injuries, causing 46% of home fires that resulted in 19% of the home fire deaths and 44% of the injuries. Heating equipment caused 16% of home fires, 19% of the deaths, and 12% of the injuries. Electrical distribution or lighting equipment caused 8% of the fires, 16% of the deaths, and 9% of the injuries. Eight percent of home structure fires were intentionally set. These fires caused 14% of the deaths and 7% of the injuries. While only 5% of home fires were started by smoking materials, these fires caused 22% of the deaths and 10% of the injuries. Download the 2016 Home Structure Fires report. According to NFPA's recent report, Fire Loss in the United States during 2015, the death rate per 1,000 reported home fires was 7.1 in 1980; in 2015, it was 7.0, only 1% lower. This suggests that most of our progress has come from preventing fires completely or from the early warning from smoke alarms. While almost all homes have at least one smoke alarm, roughly three out of five home fire deaths in 2010-2014 resulted from fires in homes in which either no smoke alarm was present (39%) or at least one alarm was present but none operated (19%). Ensuring that every home has working smoke alarms is critical. NFPA's page on smoke alarms has educational materials for local use. Fire sprinklers were present in only 7% of reported home fires. The death rate per 1,000 reported home fires when wet-pipe sprinklers were present was 79% lower than it was in home fires with no automatic extinguishing systems. Home fire sprinklers can control a fire before the fire department gets there. The Fire Sprinkler Initiative has resource materials for sprinkler advocacy. As the author of NFPA's Home Structure Fires report, I want to personally thank the firefighters, life safety educators and others who work so hard to prevent fires and to protect people from the fires that do occur. I hope that this report can be one weapon in the fight against fire. For more specific information about the fire causes mentioned in the beginning of the piece, check out the statistical reports under Fire Causes on our website. And please -- help us to help you. What types of fire experience statistics would help you in your work? Those of us who work in offices want to learn from those out in the field. When should fire departments let go of life safety rope? Should there be a requirement for the maximum number of years life safety rope is used? If so, what should the retirement age for such rope be? Share your thoughts and insights with the Technical Committee on NFPA 1858, Standard on Selection, Care, and Maintenance of Life Safety Rope and Equipment for Emergency Services. Public Comments are being accepted now through November 17, 2016. The photo, taken at the height of the fire, shows the grain elevator where the fire started, and a nearby warehouse. Both structures were destroyed. "Lightning hit Elevator "B" at about 5:30 P.M. A watchman was in the top of this elevator but he escaped injury and turned in a fire alarm immediately from an ADT box, at hand. The private fire brigade responded immediately, taking hose into the building. However, the fire spread so rapidly that the brigade could do nothing with the standpipe and hose in the building and were forced to use the spiral slide fire escapes to get out of the building. The city fire department responded quickly to the first alarm and a "third" alarm was sounded immediately on their arrival, quickly followed by a general alarm, bringing out all the companies in the city (51 engines), more than half of which were held at the fire. All five of the city fire boats and several tugs of various railroads, equipped with fire apparatus, responded. The fire spread rapidly and soon set fire to the warehouse on Pier 5 despite closed iron shutters, Pier 5 being west of Elevator "B" and wind being from the east. At that time streams were being directed on Elevator "C" from outside and also over the side of buildings from inside standpipes. Fire boats were in the slip between the two elevators. About 7:30 to 8:00 P.M. the wind suddenly shifted, due to another storm, and blew from north and west, and toward Elevator "C," setting that building on fire and causing fire boats to abandon their positions. The wind continuing from the north and west, embers and heat were carried to Pier 2, igniting that structure despite efforts to save it. Then wind again shifted to northeast, enabling firemen to save Pier 1 and Annex Pier 2. Twenty-eight standard hose streams were used on the plant water system, with pumps maintaining from 100 to 130 pounds. There was no break in the water lines, nothing went wrong with the pumps, the fire alarm system functioned, the plant fire brigade responded in minimum time, and altogether it would appear that the fire was fought as efficiently as possible, with all the protection, which was excellent, working properly." General advice about major disasters says each of us will very likely need to take care of ourselves for the first 24 to 72 hours. The former chair of the National Fire Protection Association's (NFPA) Disability Access and Review Committee said "Every one of us should be prepared to take some responsibility for our own safety regardless of our circumstances." To that end, the NFPA has created the Emergency Evacuation Planning Guide for People with Disabilities which provides assistance to people with disabilities, their employers, building owners and managers, and others as they develop emergency evacuation plans that integrate the needs of people with disabilities. This guidance can be used in all buildings, whether old or new. This webinar will review the 2nd edition of this Planning Guide and provide major topics and updated materials. Identify the specific functions that are part of a process of evacuating a building and how to build a successful plan. Allan Fraser is the Senior Building Code Specialist on the National Fire Protection Association's (NFPA) staff. Before joining NFPA, he had been the Building Commissioner in 5 different Massachusetts municipalities over twenty seven years. He is a Certified Building Official and a Certified Professional Code Administrator. He staff's NFPA's Disability Access Review and Advisory Committee. He represents NFPA on a number of committees of other standards developers. It is surprising that users of a consensus standard think that by applying the requirements they are always following best practices. Although standards are a starting point they are more often than not only a starting point. In other words, the requirements of a standard or code are at a level that the public or industry came to a consensus on. Some wanted it to do more and some wanted it to do less. Of course, there is a practical limit to a return on the investment. You could spend billions of dollars to achieve a negligible increase in electrical safety. That is also a factor when it comes to a best practice. In any event, I am not aware of any available standard which requires the absolute most that can be done. NFPA 70E® is no exception since it is a consensus standard. If NFPA 70E®, Standard for Electrical Safety in the Workplace® were the “best practice” it would only need to contain one requirement. That requirement would simply state ENERGIZED ELECTRICAL WORK SHALL NOT BE PERMITTED. That would be it. End of standard. Use an on/off switch. An inexpensive way to achieve an extremely high level of electrical safety. If there is no electricity then there should be no electrical hazard. That would be the best available practice (FACT: it is the primary method of protecting an employee required by both NFPA 70E and federal regulations). Doing anything other than this would not be the best practice since it would only serve to increase the risk of injury to the employee. Everyone should agree that something that greatly increases the potential for a negative outcome should not be considered to be the best practice. We all know that it is not an option to have this one requirement. So, the consensus standard provides a compromise of what can be done if the best practice is not applied. Again, these compromises are not the limit of what can be done and should not be considered as such. The requirements serve to establish an accepted consensus level of safety. I cannot think of any code or standard that prohibits you from doing more than what is required. There are many things that could be used to illustrate this point but I will pick one. Think about what you do when you have justified energized electrical work, have exhausted the hierarchy of risk controls and are at the step of specifying arc-flash PPE. Do you use the minimum of the standard or do you go beyond it? You have done an incident energy analysis and have determined through calculation that the incident energy will be 11.8 cal/cm2 at a working distance of 18 inches. If available do you permit the use of gear rated 11.8 cal/cm2? Do you round it up to 12 cal/cm2. The standard would allow either. Do you try to rationalize that the calculated energy should be a higher value than the real world arc-flash were one to occur? Do you keep it at less than 12 cal/cm2 because an arc-flash hood is necessary if it were greater? Do you specify something else? Maybe something rated even higher? Think about your answer before continuing on. Thought about what you would do? Now consider how you arrived at this point. You applied risk controls which included administrative and behavioral controls. You selected one calculation method which used the expected parameters and relied upon the function of several pieces of electrical equipment. This provided you with an anticipated incident energy at a very specific working distance. You will specify arc-flash PPE which has a 50% chance of the wearer receiving a 2nd degree burn based on testing of samples at a specific incident energy. Is it a “best practice” to use 11.8 cal/cm2 rated PPE for a calculated incident energy of 11.8 cal/cm2? Would the answer be the same if you were the one wearing the gear to perform the energized work? Next time: The burden of increasing the likelihood that you return home each day. In support of this year's Fire Prevention Week campaign, "Don't Wait - Check the Date: Replace Smoke Alarms Every 10 Years," we've released findings from a national survey we conducted earlier this year, showing that many people have smoke alarms in their homes that are 10 years old or older. The survey also revealed that most people (90 percent) don't know how often smoke alarms need to be replaced. Half of Americans (50 percent) have three or more smoke alarms in their current home. Almost one in five Americans who have smoke alarms (19 percent) say the oldest smoke alarm they currently have in their home is 10+ years old. When asked how often they should replace smoke alarms, nine in 10 Americans (90 percent) did not select the correct answer, which is once every 10 years. For a wealth of additional information and resources on smoke alarms and this year's Fire Prevention Week campaign, October 9-15, visit www.fpw.org. responsibility for tactical video equipment and body worn cameras used by emergency services personnel, including law enforcement, military, corrections and homeland security for surveillance, tactical information and operational intelligence. NFPA is seeking members in all interest categories to sit on this committee but especially seeking users of tactical video equipment. Apply today to bring your knowledge and expertise to the committee for this newly developed standard. Note: You will be asked to sign-in or create a free online account with NFPA before using the committee application system. Fire chiefs from the United States, Canada, Germany and the United Kingdom participated in NFPA's Urban Fire Forum (UFF) last week. Special guests at the Forum included Germany’s Technisches Hilswerk Federal Agency for Technical Relief President and CFO Albrecht Broemme; United Kingdom Fire & Rescue Advisor CFO Peter Holland; Chief Fire Officers Association of the UK (CFOA) President CFO Dave Etheridge; and International Association of Fire Chiefs (IAFC) CEO and Executive Director Chief Mark Light. Today’s firefighters respond to a broad range of emergencies and catastrophic events that have become commonplace in the United States and throughout the world. To adequately handle these crises, fire chiefs must understand and embrace the latest research, and have access to quality and timely data. The position papers endorsed by the Forum provide the information and resources needed to effectively address the challenges facing today’s fire service. The timeliness of the Civil Unrest White Paper and SOP in particular, is helpful as it can be used as a comprehensive resource for responding to incidents like the civil unrest that has occurred in cities across the U.S. over the past several months. Read our full press release to see the participating members of the UFF and more information on the group and their work. On average every year in the U.S., 92 workers are killed working in or adjacent to confined spaces. By law, employers must comply with applicable OSHA regulations such as 29 CFR 1910.146 and 29 CFR 1926 Subpart AA. NFPA announces a NEW two-day training that uses the requirements of OSHA as a base but goes beyond OSHA regulations to provide practical guidance on how to comply with the requirements in these regulations. You’ll learn directly from NFPA code experts about NFPA 350’s provisions that help you recognize, evaluate, and control hazards, so you can avoid devastating accidents. Scenario-based, hands-on exercises and collaborative discussion help you interpret and apply concepts. This class is valuable resource for anyone who designs, enters, or works in confined spaces, or supervises workers in a facility that has one or more confined spaces, including: facility managers, engineers, safety and compliance managers, risk managers, plant technicians, industrial hygienists, technicians/workers, and contractors/installers. Make the time for this important training. The class will be held in Dallas this October. NFPA® has created a 5-minute, online program to help employees identify confined spaces. Developed by Nancy Pearce, CIH, Senior Fire Protection Engineer and staff liaison to the NFPA 350 Technical Committee, this interactive program is a great resource for you to share. Plus the program serves as a preview of the format of the online training series. Click here to start the program. NFPA Online Training may be applicable to the CEU requirements for your Electrical License. Currently, electrical courses are available for Colorado, Florida, Georgia, Texas, North Carolina, and Wisconsin with more in the works. Each self-paced series qualifies for 6 - 8 hours (depending on the state) towards your license renewal. For more information on what courses can be applied to your license renewal, please select a state below. A large warehouse fire in Golyanovo, Moscow, yesterday resulted in the death of eight firefighters, who are believed to have been conducting a search inside the building when its roof collapsed. Russian rescuers had previously saved more than 100 workers at the warehouse where plastic materials and gas canisters were stored. According to news reports, the fire may have been caused by safety regulation violations. More specifically, there are suspicions that radiators had been left on, overwhelming the building's electricity circuit. The fire represents the most recent deadly fire to occur in Moscow. In January, 12 people (including three children) died in a textile factory east of the city. NFPA 400, Hazardous Materials Code, addresses safe storage of hazardous materials, while general storage requirements for materials such as plastics, are covered in NFPA 1, Fire Code. We are just about 10 days out from the NFPA 1 Second Draft meeting in Milwaukee, WI. There is still lots of preparation to do. The next week will be dedicated to preparing for the meeting: reviewing the agenda, talking with the committee Chair, finalizing task group drafts, updating extracted sections, and more. See the attached preview of what to expect at the meeting. You can access the full meeting agenda, including public comments and committee inputs, on the NFPA 1 Document Information Page. For now, it's back to work! I admit, I've got a pretty good gig here at NFPA. In July, myself and NFPA's Southwest Regional Director Ray Bizal traveled to Colorado, the world's epicenter of legal pot, to tour a half-dozen marijuana grow and extraction facilities. We met with marijuana business owners and equipment manufacturers to learn about the various agricultural and industrial processes involved in this $1 billion industry. We also met with several very knowledgeable fire officials who shared with us all the work they have done over the past several years to develop regulations and procedures to ensure that this burgeoning industry is safe for employees and first responders. I filmed the trip to share with you some of what we learned. After the video, please check out the feature story I wrote on this topic, "Welcome to the Jungle," in the September/October 2016 issue of NFPA Journal. There are a bunch of other resources there including a slideshow explaining the entire marijuana extraction process, a map that shows marijuana's legal status in each state, a detailed overview of the hazards in each type of facility, and much more. Also, read about the NFPA 1, Fire Code, task group that is working on a new chapter addressing marijuana facilities. "Forty-two men were killed and twenty-two were injured in this explosion of starch dust in a plant at Pekin, Illinois on January 3, 1924. Rescue work, in process when this picture was taken, was handicapped by the low temperature, 20 below zero, on the morning following the explosion. The force of the explosion is indicated by the ruins of the three-story brick building which formerly stood in the open space in the foreground." This is a great time to earn those last CEUs to meet your professional education requirements for the year. Or simply get the latest code training from the source - NFPA. We've taken care of all of the content for getting your code training up-to-date during the day...It's up to you to fill your activities at night—so to help you find fantastic restaurants, and other activities, visit explorestlouis.com or check out this schedule of events during this October event: American Arts Experience St. Louis. specialized provisions dealing with emergency and backup power supplies for certain health care facilities. A related component of the rule is the need for hospitals, transplant centers, critical access hospitals and long-term care facilities to carefully evaluate their emergency and standby power systems. Generator capacity and fuel supplies will need to be assessed with particular attention paid to the policy/procedure section of the rule. See the complete Emergency Preparedness Requirements for Medicare and Medicaid Participating Providers and Suppliers Final Rule. Our NFPA CMS Resource page offers tools, products and educational materials related to these new rules, as they relate to NFPA 99, Health Care Facilities Code, NFPA 101, Life Safety Code and NFPA 110, Standard for Emergency and Standby Power Systems. and the site will be updated with new content as information becomes available. Read more about this ruling by reading our full press release. Recent architectural trends include the design and construction of increasingly tall buildings with structural components comprised of engineered wood referred to by names including; cross laminated timber (CLT), laminated veneer lumber (LVL), or glued laminated timber (Glulam). These buildings are cited for their advantages in sustainability resulting from the use of wood as a renewable construction material. Research and testing are needed to evaluate the contribution of massive timber elements to room/compartment fires with the types of structural systems that are expected to be found in tall buildings (e.g. CLT, etc.). Previous research has shown that timber elements contribute to the fuel load in buildings and can increase the initial fire growth rate. This has the potential to overwhelm fire protection systems, which may result in more severe conditions for occupants, fire fighters, property and neighboring property. The contribution of timber elements to compartment fires needs to be quantified and compared against other buildings systems to assess the relative performance. The contribution of exposed timber to room fires should be quantified for the full fire duration using metrics such as charring rate, visibility, temperature and toxicity. This will allow a designer to quantify the contribution, validate design equations and develop a fire protection strategy to mitigate the level of risk to occupants, firefighters, property and neighboring property. In addition, the effect of encapsulating the timber as means of preventing or delaying involvement in the fire (e.g. gypsum, thermal barrier) needs to be characterized. Daniel Brandon and Birgit Östman, with the SP Technical research Institute of Sweden, have published the latest report on this issue through the Fire Protection Research Foundation. Their report is part of a larger project with the goal to quantify the contribution of CLT building elements in compartment fires and summarizes the literature on previous CLT compartment testing. Read the full report by downloading it free of charge. Anyone may submit a comment on this proposed TIA by the November 4, 2016 closing date. Along with your comment, please identify the number of the TIA and forward to the Secretary, Standards Council by the closing date. NFPA 25: Inspection, Testing, and Maintenance of Water-Based Fire Protection Systems (2017) 1-Day Classroom Training is scheduled for October 6 in St. Louis, November 10 in Seattle, and December 15 in Orlando. This new, one-day NFPA training uses collaborative discussion and job-based activities to explain inspection and testing rules for sprinkler system components, signs of corrosion, managing impairments, the owner's responsibilities for compliance, and ITM task frequencies. Click here for more information and to reserve your seat. What In The World Is A Marine Chemist? with NFPA 306, OSHA and the US Coast Guard. tanks or spaces on ships or barges that contain or previously contained combustible or flammable liquids or gases. We have recently been awarded an Assistance to Firefighters Grant (AFG) to begin the development of a National Fire Data System (NFDS) and wanted to share the news with you all. The goal of NFDS is to address the priority needs of the U.S. fire service and generate quality local and national data for both operational and community risk reduction decision-making. The powerful new tool will incorporate substantial learning from the recently AFG-funded NFORS project and utilize all available and relevant data sources. Dr. Matt Hinds-Aldrich, formerly with Atlanta Fire Rescue Department’s Assessment & Planning Section, was recently hired to support the NFDS project as its program manager. Reporting to Dr. Nathaniel Lin, NFPA’s data analytics & strategy lead, he will coordinate with the fire service on data to support performance management, organizational problem solving, and the implementation of predictive community risk reduction strategies. Read the full press release to learn more about the NFDS project and what it will look to accomplish in the future. "Large spaces between partitions were used as ducts for pipes, vents, etc. and formed a flue of liberal size directly connecting the cellar with a large combustible attic. The result was that when the fire occurred in the cellar it immediately communicated to the attic causing the roof to collapse, and involving heavy damage to the entire building with the exception of the masonry walls." NFPA has created a 5-minute online training program to help identify confined spaces. You may have a confined space on your property and not even know it. Developed by Nancy Pearce, CIH, Senior Fire Protection Engineer and staff liaison to the NFPA 350 Technical Committee, this interactive program is a great resource for you to share. NFPA 350: Safe Confined Space Entry and Work Online Training Series is dedicated to protecting workers from confined space hazards. Three one-hour online modules use a combination of scenario-based interactive exercises, onscreen visuals, and video to explain how to protect personnel who enter into confined spaces for inspection or testing or to perform associated work. Knowledge checks and printable job aids help ensure you're ready to apply concepts effectively on the job. clicking on free access to review online. This all-new Guide is essential for anyone who designs, enters or works in confined spaces, or supervises workers in a facility that has one or more confined spaces including facility managers, risk managers, safety directors, architects, engineers, industrial hygienists, construction workers, and technicians. Be prepared to recognize, evaluate, and control confined space entry hazards. The latest issue of NFPA Journal explores the building and fire safety challenges that come with the burgeoning marijuana industry as several states look at legalization at the polls this November. In the cover story, “Growing Pains,” Associate Editor Jesse Roman explores the fast-paced commercialization history of marijuana, chronicling Colorado’s transition to medical marijuana legalization and authorized recreational use in just three short years. Growers, inspectors, fire officials, and other stakeholders weigh in on the different hazards that Colorado encountered along the way and that, in some cases, remain unresolved as other states seek to legalize pot later this fall. Learn more about what is included in this month's issue by taking a look at the full press release. Read the digital version of the September/October 2016 issue using the NFPA Journal mobile app. The app is available for iOS and Android devices and is available through the Apple App Store and Google Play. Last Thursday, a blog was posted highlighting a proposal in the upcoming edition of NFPA 1001, Standard for Firefighter Professional Qualifications. It stated that the proposal would require EMT certification for all career and volunteer firefighters. However, that information did not accurately reflect the Public Inputs that were sumbitted for NFPA 1001. The Public Inputs are numbers 133 found starting on page 76 of the report and 134 starting on page 98. Public Comments on these or any other Public Inputs submitted for the First Draft Meeting can be submitted through the document pages for consideration at the upcoming Second Draft Meeting on January 23, 2017. The closing date for submitting Public Comments for NFPA 1001 is November 17, 2016. Again, I apologize for the inaccuracies in last week's blog and related social media posts, and for any confusion they caused. On a positive note, the high level of online dialogue and engagement this issue generated shows just how committed and passionate the fire service is around the work they do, and the powerful influence their voices collectively have. As we continue to promote specific issues around standards that directly impact firefighters on the job each and every day, we encourage everyone to continue making their voices heard. Please remember that all NFPA codes and standards are developed through an open consensus process. All stages of the process can be viewed online, and we encourage the broadest participation among all interested parties. For more information on how our codes and standards are developed, take a look at "How the Process Works". Fire departments that think they’re worthy of some “flashy” attention should start getting camera-ready: Between now and October 7, 2016, we are hosting our first-ever “Get Ready for Your Close-Up” catalog contest, where one U.S. fire department will be randomly selected to receive a professional photo shoot for the cover of our 2017 Fire Prevention Week catalog. Along with being on the cover, photos and stories highlighting the daily tasks and efforts of the winning department will be featured throughout the catalog, which will be distributed next May to fire departments, safety advocates, educators and other groups nationwide. First Alert, a leading smoke alarm manufacturer, is actively supporting the contest by donating 500 smoke alarms to the winning fire department as well! To enter your fire department in the “Get Ready for Your Close Up” catalog contest, sign up on NFPA’s website between now and October 7, 2016. One fire department will be randomly selected and announced during Fire Prevention Week. For more information, read NFPA’s official contest rules and regulations. Do you have an interest and expertise in Unmanned Aerial Systems (UAS) for emergency response? At its August 2016 meeting the NFPA Standards Council approved UAS standards development activities and established the NFPA Technical Committee on Unmanned Aerial Systems (UAS-AAA). This committee is currently seeking experts in the UAS field. We currently have a number of applications from the fire service. Applicants are being sought with UAS law enforcement experience, with state and/or federal responsibilities for establishing UAS policy, and with manufacturing expertise in UAS systems to create a balanced committee. This committee will be responsible for drafting the first NFPA Standard on UAS for emergency services. The September 2016 issue of NFPA News, our free monthly codes and standards newsletter, is now available. At least 23 were killed and dozens more were injured in a fast-moving, massive fire at the Tampaco Foils Ltd. factory in Tonga, near the Bangladesh capital city of Dhaka. According to news reports, workers were preparing to swap shifts when an explosion occurred in the boiler room of the five-story building and quickly spread due to chemicals being stored at the facility. Boiler room fire incidents such as these are addressed in detail in NFPA 85: Boiler and Combustion Systems Hazards Code. The blaze at the food and cigarette packaging factory is the worst industrial accident in the country since 2013 when the Rana Plaza building collapsed and killed more than 1,100 people. There were approximately 100 people in the building on Saturday morning when the explosion occurred at the Tampaco site that packages goods for global brands including British American Tobacco and Nestle. Inexpensive manufacturing is a major industry in Bangladesh and a significant component of the country's economy. Regarded as one of the world's leading garment exporters, the region continues to struggle with building and fire safety issues. In response to persistent large scale tragedies, the Alliance for Bangladesh Worker Safety (the Alliance), a coalition of 28 American and Canadian retailers, was formed. Months after the Rana Plaza collapse, the Alliance launched a five-year effort to inspect and oversee safety remediation of approximately 650 garment factories in Bangladesh that serve the Gap, Wal-Mart, Target, Costco, and others. The factories aligned with the Alliance employ about 1.2 million people - mostly women. NFPA and the University of Maryland were invited by the Alliance to provide an independent review of their factory upgrade program designed to improve worker safety. In March of this year, NFPA released the Bangladesh Ready-Made Garment (RMG) Industry High-Level Assessment Report. The document looks at Bangladesh’s fire and building safety standards, protocols, inspection procedures and training programs for ready-made garment (RMG) factories, and provides short- and long-term recommendations to improve fire and life safety at these facilities. To find out more about factory fire and life safety challenges in Bangladesh, read NFPA Journal® content or listen to a podcast here. Beverly, MA headquarters on the 15-year anniversary of September 11, 2001. Massachusetts Urban Search and Rescue Task Force (MA-TF1) will hold a public ceremony this Sunday, on the 15th anniversary of 9/11, to dedicate a recently completed memorial that pays homage to first responders and others who died in the terrorist attacks in New York City, Washingon, DC, and on board United Flight 93, which crashed in Shanksville, Pennsylvania on September 11, 2001. MA-TF1 members will lead tours of the 9/11 monument. A formal ceremony will begin at 9:30 A.M. and include a moment of silence at 9:58 A.M. to mark the collapse of the South Tower of the World Trade Center (WTC). Fred P. LaFemina, former Chief of Rescue Operations for the Fire Department of New York (FDNY) and one of the first to respond to the WTC attacks, is the scheduled keynote speaker. The National Urban Search and Rescue (US&R) Response System, authorized by FEMA in 1989, is a framework for structuring local emergency services personnel into integrated disaster response task forces. MA-TF1, armed with necessary tools, equipment, specialized skills and techniques, can be deployed at a state and/or local level for the rescue of victims of structural collapse. If there is a large scale national event, task forces are deployed by FEMA. MA-TF1 is one of 28 teams in the United States prepared and ready to respond when disaster strikes. The idea for the 9/11 memorial at the MA-TF1 site began in 2009. The task force applied for a piece of history from Ground Zero as soon as the Port Authority of New York and New Jersey announced that they would accept requests for pieces of WTC steel. MA-TF1 received a steel section from the North Tower of the WTC that was impacted by the hi-jacked American Airlines Flight 11. Known as “impact steel”, the steel section measures approximately 21 feet long and seven feet wide, and weighs approximately 1500 pounds. The MA-TF1 memorial also features a dried flower that was placed into a bolt hole as a memorial in 2001. The flower has been preserved as part of the memorial. Sunday's dedication will take place at 43 Airport Road in Beverly, MA and all are welcome to attend. Visit the MA-TF1 for more event details. 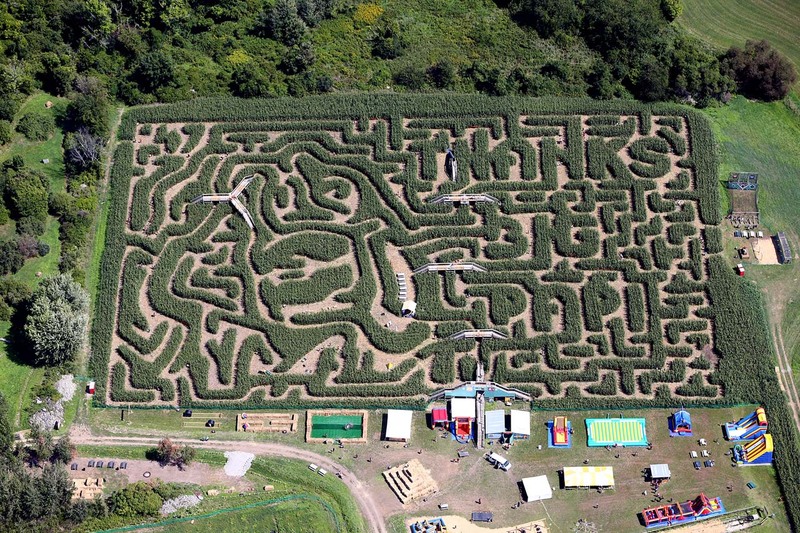 I have been writing weekly posts about NFPA 1, Fire Code, issues since March and have waited patiently for 6 months to write about the requirements in the Code for corn mazes (I had to wait until the right time of year!) because 1. I love corn mazes, and 2. I love fall in New England. Did you know that NFPA 1 contains provisions for corn (crop) mazes? The Fire Code has it all. Last week, corn mazes even made the news in Boston, as our local baseball hero, David Ortiz, was presented with a corn maze design in his honor. One might not think of a corn maze as somewhere with a great fire safety risk. However, crop mazes pose unique fire safety problems due to their configuration (confusing paths and lack of marked egress) and the inherent combustibility of the maze materials. NFPA 1 addresses a number of requirements pertaining to these crop mazes. Some of the biggest concerns are communication of regulations and instructions to both employees and visitors and making sure there is a way to make announcements to visitors should an emergency occur. It is also important to reduce the likelihood for a fire to occur by keeping potential ignition sources at a safe distance from the maze. Do you have plans to visit a corn maze this fall? The requirements from NFPA 1 will help ensure we all stay safe and have fun while enjoying these outdoor attractions this season. 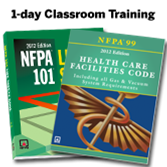 Are you now expected to comply with NFPA 99: Health Care Facilities Code (2012)? Get a working knowledge of the Code requirements with training from NFPA instructors. The U.S. Centers for Medicare & Medicaid Services (CMS) has officially adopted the 2012 edition of NFPA 99: Health Care Facilities Code. NFPA's expert-led two-day training program explains what's different about the 2012 edition of NFPA 99 and how will it impact your work in all types of health care settings. This is a must attend for anyone concerned with NFPA 99 compliance including: Engineers, facility managers, AHJs, plumbers, gas and vacuum system installers and verifiers, security personnel, insurance professionals, and equipment manufacturers. Dramatic changes in the renamed NFPA 99: Health Care Facilities Code reflect today's environment of patient care where procedures are performed in a wide variety of locations -- requiring safety guidelines based on a risk-based framework to facilitate adoption and enforcement throughout an increasingly decentralized health care system. This is a new 1-day NFPA classroom training developed for anyone responsible for NFPA 101®, NFPA 99, and CMS compliance including: facility managers, engineers, designers, consultants, facility owners, and executive directors. Take an inside look at key changes between the 2000 and 2012 editions of NFPA 101 and the 1999 and 2012 editions of NFPA 99 and get up-to-date on how the recent CMS decision impacts health care facilities. The photo above shows the damage to the Brown-Camp Hardware Store in Des Moines. The Tone Brothers wholesale coffee house and spice mill located adjacent to the hardware store remained largely intact with some damage to the party wall and some water damage in the basement. NFPA's proposed standard, NFPA 1300, Standard on Community Risk Assessment and Community Risk Reduction Plan Development, is seeking public input on its preliminary draft. The preliminary draft allows the public to review and submit any suggested revisions prior to the publication as a First Draft Report. The deadline for submitting public input for this new standard is June 28, 2017. To submit a public input using the online submission system, select NFPA 1300 from the list of NFPA codes and standards or use the direct link http://www.nfpa.org/1300next . Once on the NFPA 1300 document page, select the link "The next edition of this standard is now open for Public Input" to begin the process. You will be asked to sign-in or create a free online account with NFPA before using this system. Review further instructions on how to use the online submission system. If you have any questions when using the online submission system, feel free to contact us. It’s been 15 years since 9/11. Will we ever return to 'normal'? Five years ago, I shared my reflections on how the fire service was impacted by the events of September 11, 2001. This was the tenth anniversary of that horrendous day, when so many lives were lost and millions of Americans saw their lives forever changed. In anticipation of the 15th anniversary of 9-11, I watched the video to see if my observations still rang true, and the answer is yes, for the most part. The US fire service did take the lessons learned from 9-11 and adapt to this new threat of terrorist attacks on our homeland. Heightened awareness, new training, and improved equipment along with increased federal funding and grants and overwhelming public support for the fire service created a better foundation for the fire service to respond than previously existed. But that foundation is showing signs of stress. Federal funding and grants have shrunk, leaving some departments unable to maintain equipment previously purchased. Public support has waned, and the fire service is dealing with public policy and budget officials who see the events of 9-11 thru the fog of 15 years, as a one-time event and not an ever present threat. During the 2011 video, I mentioned the challenge of the long road to normalcy and risk of occupational illness to those who responded. With the construction of a new World Trade Center and rebuilding of the Pentagon complete, some may think normalcy has returned. But for the tens of thousands of responders and their families who have endured post-traumatic stress and debilitating and sometimes fatal respiratory illnesses and cancers, they will never see a return to normalcy. If you happen to travel thru Logan Airport, you may see two gates/jet bridges that fly the American flag 24/7. American Airlines flight 11 departed from Gate 32 and United Airlines flight 175 departed from Gate 19 on September 11, 2001, each of these later being flown into the World Trade Center. Each time I see those flags, I am brought back to September 11, 2001. After reflecting how much that day changed my life, I say a prayer for those we lost that day and through the years that followed. I remember their families and the struggle they face each day. Oh-Never Mind: Will You be Receiving or Kicking? A phenomenon not seen since the 1960s will take place this coming Saturday in Tennessee. A college football game featuring Virginia Tech and Tennessee will take place at the Bristol Motor Speedway — normally home to one of NASCAR’s most exciting short track racing events. NASCAR officials will be replaced by a crew of college football officials and sports fans drawn from both colleges will descend upon the half mile track. The Battle at Bristol has been in the planning stages for several years and will offer a unique opportunity to see what should be a good match up between these two teams. In fact, the football configuration of the venue is set to handle about 150,000 fans thus potentially breaking the attendance record for a college football game. So how does a venue used for racing get transformed into a football stadium? Very carefully and with intent. Thanks to, Construction Cam you can see the transformation. And this relates to NFPA how? It is a good reminder about the Life Safety Evaluation (LSE) that is required byNFPA 101® Life Safety Code® for many types of assembly occupancies. While the vast majority of college sporting events are played in purpose built stadiums and arenas, taking the competition to an alternative site generates a unique backdrop-something appears where it is not expected. What doesn’t change, however, is that all of the setting bring along a crowd of fans, followers and cohorts and each venue falls under the code rules for an assembly occupancy. Many of the NFPA 101 provisions for assembly occupancies apply to the brick and mortar rules: allowable construction types; fire alarm and voice evacuation systems; sprinkler systems; number, size and arrangement of exits; design of stairs; and the requisite rules for guards, railings and walking surfaces that also contribute to the normal use of the building. NFPA 101 governs much more than fire safety and this is especially true in assembly occupancies. The LSE is defined as A written review dealing with the adequacy of life safety features relative to fire, storm, collapse, crowd behavior, and other related safety considerations. In fact, the LSE outlines 10 major categories to be considered. These include: Nature of the events and the participants and attendees; Access and egress movement, including crowd density problems; Medical emergencies; Fire hazards; Permanent and temporary structural systems; Severe weather conditions; Earthquakes; Civil or other disturbances; Hazardous materials incidents within and near the facility; Relationships among facility management, event participants, emergency response agencies, and others having a role in the events accommodated in the facility. The LSE is a bridging tool that brings together venue operators, code based rules, emergency planning and first responders to make sure everyone has a fun-but more importantly safe time. While the LSE can influence the necessary safety outcomes, it can’t influence the final score. That is up to the actual safeties on the two teams. A Chuckey, Tennessee man will wrap up a cross country ride in support of first responders today in Boston. After watching the news last fall and hearing about police officers being shot, 60-year old Bill Morin quit his job, bought his first bike in 27 years and began training for an awareness ride to remember. The father of three set out from Seattle in June and will arrive at the historic setting of Paul Revere's ride in Boston's North End later today (earlier than planned). A Coast Guard veteran, Morin has no connection to law enforcement or the fire services, he simply wanted to say thank you to first responders and the military so he trekked across the country to bring attention to those that work in law enforcement, the fire services and the armed forces. Riding roughly 55 miles per day, Morin made stops in 23 states. Earlier this summer, Morin told the News Gazette, "I'm just an ordinary guy who wants to say thank you." We thank you, Bill Morin, for respecting our first responders and riding in their honor. Many have asked how the OSHA HazCom2012 classification numbers, which are inverse in severity from 704 rating numbers, would impact NFPA 704 and whether or not the rating system in NFPA 704 would be changed during the next revision cycle. The newly released 2017 edition of NFPA 704 addresses this concern and provides the user with the rationale for maintaining the current emergency response system. A new Annex G has been added to the standard that explains why the ratings remain the same and compares NFPA 704 to OSHA HazCom 2012. To summarize, OSHA and NFPA are in agreement that there are differences between HazCom 2012 and NFPA 704 with two distinct set of numbers developed for different purposes. HazCom 2012 uses a hazard classification system whereas NFPA 704 uses a hazard rating system. The NFPA 704 label has been used for over 50 years and was developed to provide a simple, readily recognized and easily understood system of markings to provide information in a concise manner to emergency personnel responding to a spill or fire. In comparison, OSHA’s hazard classification system provides information for workers exposed to materials primarily under normal conditions of use. The numbers that are part of the OSHA HazCom 2012 hazard classification system are required in Section 2 of the new SDS format. These numbers are then used to determine the correct pictograms, signal words and hazard statements for container labels but the numbers themselves are not required to be posted on labels. For further information you can view the 2017 edition of NFPA 704 by creating a free email account www.nfpa.org/704. You will also be able to download two free documents including a, “NFPA/OSHA Comparison" Quick Card and an updated “Frequently Asked Questions" document. See the full list of documents in the Fall 2017 revision cycle. NFPA's smoke alarm messages are hitting the Big Apple! The above 30-second PSA promoting the potentially life-saving impact of smoke alarms is being featured in New York City's Times Square between now and the beginning of November. If you happen to be in the area over the next few months, make sure to check it out! It's located at the 1500 Broadway Screen. Anyone may submit a comment on these proposed TIAs by the October 21, 2016 closing date. Along with your comment, please identify the number of the TIA and forward to the Secretary, Standards Council by the closing date. We all get bogged down in the day-to-day details of our lives. But it’s important to take a step back sometimes and look at the forest, not the trees. As the immediate Past President of the International Association of Fire Chiefs (IAFC) and the current President of the Metropolitan “Metro” Fire Chiefs’ Association, I’ve had a lot of opportunities recently to look at the big picture of the fire service, what’s changed, and what challenges lie ahead of us. Regardless of whether you are a member of a large metropolitan department, a small rural volunteer department, or somewhere in between, I believe you can find something in the points below to better serve your community and its citizens. I like to put those changes and challenges into three broad categories: Building upon the Past, Responding to the Present, and Preparing for the Future. The fire service is continuing to improve in this area, but there is still work that can be done. We need to continuing to work on reducing firefighter deaths, including Line of Duty Deaths and preventable medical conditions. This includes making sure our people get regular physicals and maintain a healthy lifestyle. As improved safety measures and lessons learned are implemented in our industry, we need to continue to embrace positive change such as developments in technology that can help our firefighters. Embracing technology and all it can offer is an opportunity we cannot afford to let pass by. The D-block radio spectrum is a prime example of this. This is not only the obvious (dollar and life loss) but also the proactive steps we can take—smoke alarm installations in at-risk neighborhoods, residential sprinklers, for example—to lead the way in enhancing firefighter and citizen safety. As we continue moving forward as an industry, I hope each of you will take the opportunities that you have to see the forest. Only then will we be able, as a whole, to figure out how to best support the trees. We'd like to hear from you! In a post-9/11 world. what are the most pressing issues and challenges facing today's first responders? As a Bostonian I have to admit I was impressed this week with the statue that LEGO created for David Ortiz, the Red Sox' beloved designated hitter, who will wrap up his hall-of-fame Major League Baseball career this year. Big Papi has received a lot of cool bon voyage gifts this season, but the LEGO replica in his likeness definitely stood out from the slugger's farewell swag. I'm not surprised at LEGO's ingenuity, generosity and support of game-changers though. NFPA has partnered with LEGOLAND for several years showing support to other heroes - first responders. In fact, LEGOLAND announced this week that they are once again offering free admission to first responders at LEGOLAND Florida Resort throughout the month of September. The incentive for active firefighters, police, EMS, and a host of other enforcement officers and up to three of their family members at the Winter Haven, Florida theme-park is just one of many engagement activities that LEGOLAND stages, with the support of NFPA, throughout the year. NFPA is proud to partner with both the Florida destination and LEGOLAND California Resort in Carlsbad to create awareness of first responders, fire prevention tips and emergency response efforts year round. From now through October at LEGOLAND Florida Resort, families can enjoy a myriad of other fun activities. On October 7th, the Polk Country Fire Department will be onsite to interact with visitors to the park, participate in challenges, ask trivia questions, help kids try on firefighter uniforms and hand out NFPA's Fire Prevention Week collateral. First responders will also be onsite on Firefighter Fridays throughout the rest of October at the Florida location to interact with park visitors. At LEGOLAND California Resort, park officials will conduct fire-theme LEGO builds, trivia contests, and provide fire safety tips on October weekends. NFPA will also share Halloween fire safety tips and fun materials during the popular Brick-or-Treat activities that take place every weekend in October at each park. NFPA works with both LEGOLAND sites throughout the year, sharing fire safety information with the families who visit the hands-on theme parks each year. Currently, both parks are showcasing messages about smoke alarms and escape plans on wall murals, display signage, and via videos played in park theaters and attraction cue lines. Be sure to visit the LEGOLAND Florida Resort site above to learn more details about free first responder admission in September. All technical committee meetings are open to the public. 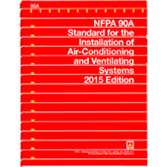 NFPA 90A covers construction, installation, operation, and maintenance of systems for air conditioning and ventilating, including filters, ducts, and related equipment, to protect life and property from fire, smoke, and gases resulting from fire or from conditions having manifestations similar to fire. 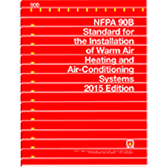 NFPA 90B covers construction, installation, operation, and maintenance of systems for warm air heating and air conditioning, including filters, ducts, and related equipment to protect life and property from fire, smoke, and gases resulting from fire or from conditions having manifestations similar to fire. It's back to school time. Time for teachers to prepare their classrooms for the upcoming school year and welcome students back to classes. Where does the summer go? Soon artwork will cover the walls, student projects will be on display, and lockers will be overflowing with books and supplies. Educational occupancies, defined in NFPA 1, Fire Code, as "an occupancy used for educational purposes through the twelfth grade by six or more persons for 4 or more hours per day or more than 12 hours per week" include preschools, elementary schools, high schools, and the like. These facilities are inspected frequently and kept under a close watch by code officials. The day to day activities of a school can be greatly impacted by a document such as the Fire Code. Draperies, curtains, and other similar loosely hanging furnishings and decorations have to meet specific performance criteria from NFPA 701, Standard Methods of Fire Tests for Flame Propagation of Textiles and Films. Clothing and other personal supplies cannot be stored in the corridors unless the corridor is sprinklered, has a smoke detection system, or where the supplies are stored in metal lockers that do not interfere with the egress width. Clothing hung on hooks along corridor walls or on racks in school lobbies greatly increases the combustible load and will generally allow flame to spread quickly. Artwork and teaching materials can be attached to the walls but cannot exceed 20% of the wall area in a non-sprinklered building and cannot exceed 50% of the wall area if the building is fully sprinklered. Because the combustibility of the artwork cannot be effectively controlled, the quantity, in terms of the percentage of wall area covered, is regulated to avoid creating a continuous combustible surface that will spread flame across the room. It may be advantageous not only to limit the quantity of artwork displayed but also to avoid placing such materials near a room’s exit access doors. Enjoy the last official weekend of summer, and stay safe. I look forward to discussing more seasonal Fire Code issues in the coming weeks. And, check out these past Fire Code Friday posts for guidance on how to stay safe and help others stay safe this Labor Day weekend! Friday September 2nd marks the 350th anniversary of the start of what is now known as the Great Fire of London. The fire started early on the 2nd and after the fire was extinguished several days later, approximately 4/5 of the city was destroyed including 13,200 houses, 87 parish churches, The Royal Exchange, Guildhall and St. Paul’s Cathedral. Czech artist Wencelaus Hollar was working on a map of the city before the fire and was involved in mapping the damage as a result of the conflagration. The image above, from the original in the British Library, depicts the city before and after the fire. Captain Stephen E. Sanislo of the Seattle Fire Department. Captain Sanislo served in the Tank Corps in WWI, and upon his return from the war he served the department by providing fire protection education. In the six months following his return from the war he instructed more than 43,000 schoolchildren and 12,000 adults.